Bacardi global travel retail is continuing its single malts momentum with the release of Craigellachie Speyside single malt Scotch whisky in two aged editions – a 13YO – and a travel retail exclusive 19YO. The first presentation is being hosted by SAR at Amsterdam Schiphol Airport this month as a European exclusive launch, with further upcoming launches with selected global retailers later in the year. Read more about the launch of The Last Malts Range. Craigellachie is distilled by John Dewar & Sons, one of the most respected names in the world of Scotch whisky. The launch of the Crai gellachie Speyside single malt Scotch whisky is the latest element in the Bacardi Global Travel Retail strategy in offering authentic new options and providing incremental sales opportunities among malt enthusiasts. Craigellachie has long been admired by malt enthusiasts but, besides private bottlings, its liquid has never been released until now. 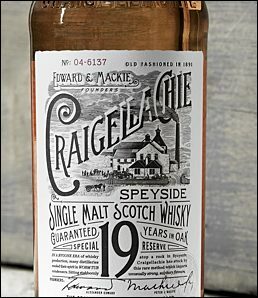 This is the first time that Craigellachie has released a portfolio of single malts. The distillery stays true to its traditions of whisky-making, including the use of worm tubs. In a bygone era of whisky production, many distilleries used worm tubs to cool their spirit in a far slower and gentler manner than modern condensers, allowing the distillate to retain earthier, meatier qualities. Craigellachie has stuck by this rare and traditional method, despite the expense involved, as it produces a far heavier spirit and imparts unusually strong, sulphury flavours. Craigellachie is the only distillery to use malted barley from a particular kiln in Glenesk. It is, unusually, produced using an oil fire, giving the specific level of sulphur desired and leading to a spirit with a noticeably heavier character than most. The Gaelic name Craigellachie means ‘rocky hill’ and both the name and the distillery’s dramatic location – on a rock overlooking the spot where the Rivers Fiddich and Spey converge – in the heart of Speyside express the individuality of this extraordinary malt. Mike Birch, MD, Bacardi Global Travel Retail explains how the new launch further advances the company’s continuing vision for malts: “Bacardi has outstanding whisky assets that perfectly address the needs of experienced connoisseurs wishing to share more knowledge and sophistication in their malts appreciation. We are releasing a select series of ‘Discovery Malts’ that reflect the perfect alignment of those precious assets with the needs of that target shopper. Richard Cuthbert, Bacardi Global Travel Retail marketing manager whisky adds: “The Craigellachie Speyside single malt Scotch whisky is a true standout malt that provides an absolutely extraordinary flavour experience that malt enthusiasts will be fascinated by and keen to discover and experience for themselves. But this malt is also about so much more than the power of the flavour. The Craigellachie is backed by a compelling story that fascinates malt enthusiasts and gives them a feeling of discovering a truly rare, long-hidden gem from the very heart of Speyside. “Particularly through the travel retail exclusive offer of the 19YO, this launch is an ideal opportunity for us to connect with these sophisticated consumers and further drive differentiation and penetration for the category. The whisky is full-flavoured with burnt rubber-like tones, sulphury elements, lingering smoke and well balanced with tropical fruit tones that intensify with age. The powerful flavour is inspired by the unique use of oil fired malt with worm tub condensers to distil a robust malt with sulphury notes. The Craigellachie is particularly appealing to malt enthusiasts who have experienced peaty malts and now seek a more intense and individual experience. The packaging has been designed by Stranger and Stranger, London.